From Camping Armanello we encourage you to discover the Costa Blanca and Alicante Province. It’s going to surprise you! 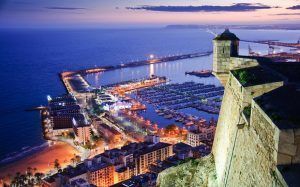 Alicante, the provincial capital where Camping Armanello is located, is the second most important city in the Region of Valencia. Around 300,000 people is living in the city, but it welcomes a large number of visitors throughout the year. Here you have some information to know the city a bit better. How is the weather in Alicante? This beautiful Mediterranean city has a very pleasant climate the whole year: warm summer and mild winter. The average annual temperature is around 18ºC (65ºF)! For this reason, it is possible to enjoy Alicante beaches at any time. The most famous is Playa del Postiguet, an urban beach with all services and fine sand. On the other hand, the most extensive and quiet beach is San Juan Beach and also, we can find numerous small coves and paradisiacal beaches. The old town and Barrio de Santa Cruz are perfect for getting into the Mediterranean and Alicante culture. Between the walls of the castle and streets you can make a break in any of the bars and terraces. The baroque palace where is located the city hall stands out in the architecture. City’s port, right in the heart of the city, has become one of the most popular leisure spots in the city: restaurants, casino, nightclubs… Esplanade of Spain is a parallel boulevard to the port where there are craft stalls throughout the year. To finish this small tour, we cannot forget Santa Bárbara Castle. It is one of the most famous symbols of the city and you will find incredible views. Enjoy its history and continuous exhibitions. And if you are looking for a cultural plan, it is a good idea that before going to the castle, you also visit MARQ (Provincial Archaeological Museum of Alicante). What can I do in Alicante? How is the local gastronomy? Rice is the most traditional dish in the province of Alicante. There is a big tradition and culture around how to cook rice and which are the best products for it. Also, fish and seafood are treated very carefully. But if you want to eat international dishes, you are in the right place as there is a wide variety of restaurants. When are the Hogueras de San Juan (Bonfires of Saint John)? From the 20th to the 24th of June the city becomes a mixture of light, sound and colour. An incredible week where everybody is welcome. Do not miss the official festivity of Alicante! How do I get to Alicante from Benidorm? From Benidorm, TRAM connects the two cities in about an hour and fifteen minutes. It is a very nice journey to enjoy the view, as it goes along the coast, and there is no possibility of getting lost as it finishes at Plaza de Luceros. By car, it will only take you half an hour to get around. Moreover, there are buses from the bus station in Benidorm, very close to the campsite. This is just a small summary but there are so many other things you can discover. If you want more information, you can visit Alicante Tourism website. A nice excursion if you are staying at the campsite. Live Alicante!